Where do all these people reside when the Fair is not going on? 2. Trying all of the new foods. Okay, maybe not all of them. The one that caught my eye was the new candied bacon cannoli from Ole’s Cannoli. 3. Free Hanson concert (or any of the free concerts). My middle school self is thrilled. Mmmm Bop. You can watch Hanson for free at the Bandshell on August 26th and 27th at 8:20PM. I heard their new single is pretty good. I am sensing a come-back. 4. Visit the new attractions. Art made from seeds, it can not be missed in the AG & HORT building. 6. The Fine Arts Building. This building houses great work from local artists. I always love to walk around and see amazing work that people have created. Meow. Wednesday, August 28 at 7:00PM. Tickets are $10. I went last year to the one at the Walker Art Center and it was purrfect. 8. All you can drink milk & Martha’s cookies. If you haven’t figured out how to do this yet it is pretty easy. First, buy a bucket of Martha’s to share. Next, walk over to the all you can drink milk booth and buy a cup. Then, eat cookies with ice cold milk. Enjoy! When will they put the booths next to each other? I want to see the rabbits in the poultry barn. Why? because they are cute and fluffy. 10. Eat all of your favorite foods. Get the staples: Corn Dog, Pronto Pup, Cheese On a Stick, Deep Fried Candy Bar, Luigi Fries, Cheese Curds, and Mini Doughnuts. Have any questions about the fair? I am somewhat of an expert, so ask away. 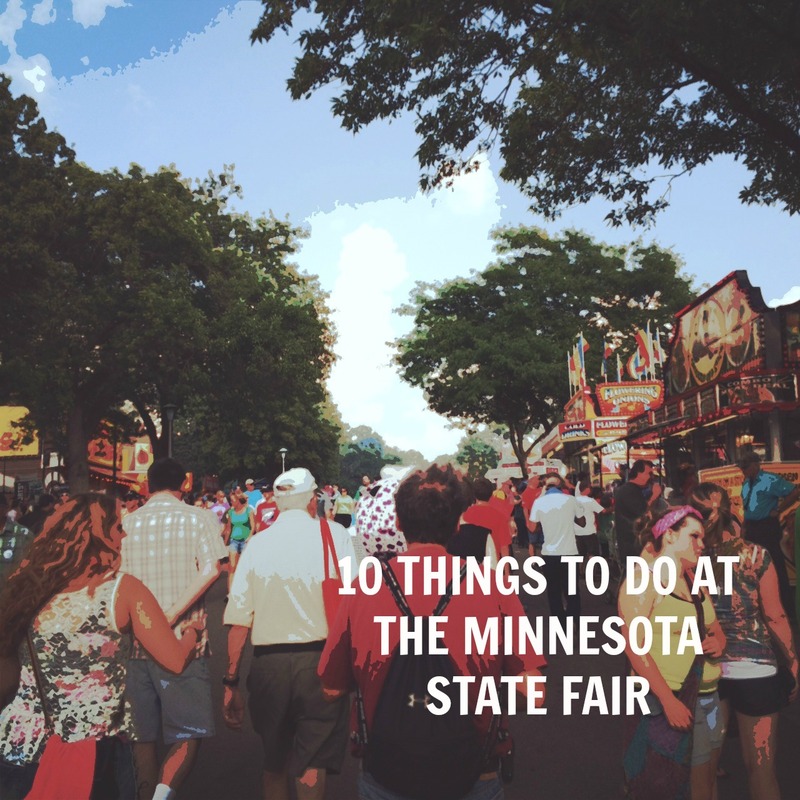 What do you look forward to at the MN State Fair? I used to work at the fair and always spent way too much time there. The fair is pretty unbearable on really hot days. Make sure you spend enough time inside. The food building doesn’t count. That place is blazing hot no matter how hot it is outside. Oh I know, went in there last year and didn’t help… though they did have the Nitrogen-frozen Ice cream <.< I learned quite a few lessons about how to PROPERLY handle heat and eat/drinking at the Fair last year, hopefully I can put them to the test on Sunday. Hopefully you won’t have to do that. Fingers-crossed for a perfect day at the fair!